The LG 65R9 is, as the title suggests, a 65-inch TV capable of uncoiling itself from the confines of it’s base, like a mechanical, less creepy jack-in-the-box. That base is no one trick pony either, housing a 4.2 channel Dolby Atmos sound system, with a 100w power output, supporting Google Assistant, Amazon Alexa, Apple Airplay 2 and Apple HomeKit, your only concern will be remembering all your AI assistant’s names. Apple HomeKit support allows you to control your TV using Siri or via the Home App on your iPhone, what a time to be alive. The LG OLED R has three modes of engagement, there’s Full View, Line View, and Zero View, hardly the most cryptic naming convention you’ll come across, that said, here’s the run down of what each entail. Full View is for normal TV viewing, the least interesting, yet the most important of the three modes. Line View shows just the top quarter of the screen, useful for displaying things like music playback, clock and weather information. 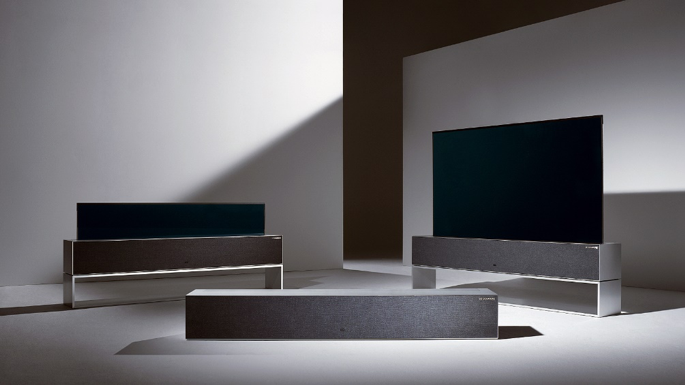 Zero View doesn’t need too much explanation, it allows for the very capable base speaker to do its musical mission with no interruption from the whopping display, essentially making the LG OLED R not only a viewing investment, but potentially an audible investment too, keep that in mind when you’re trying to justify that price tag. The LG OLED R shares its display with the previously praised OLED C and E series and has most of your HDR needs met, other than HDR10+ which is missing from the roster, it’s fair to say you’ll be impressed by the image quality. 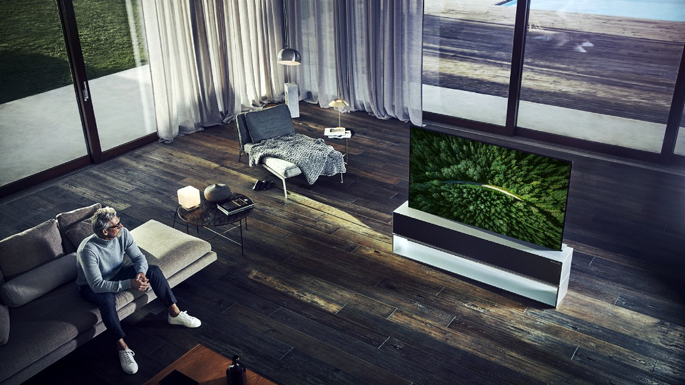 LG’s flagship TV last year was the LG OLED W, or Wallpaper, the selling point being its ludicrously slim design, to sit as flush to your wall as possible, making it less intrusive into your living space. This year’s model continues to push that trend, LG would like to make the overbearing black screen sat so cumbersomely in the corner of your room a thing of the past. With no price as of writing, it’s unknown how hard this TV will hit your bank balance, I think it’s a guided judgement to say pretty damn hard. LG’s OLED W, the wafer-thin wallpaper TV that LG released last year came in at an eye watering £20,000, but hey, that’s the price you pay for innovation, right?